The presence of logs, root wads, and boulders in streams slows water, creates deeper pools, and provides much needed cover for juvenile fish. As the water slows more gravel is deposited in the streambed, which is essential for spawning fish species. Gravel also has a cooling effect on stream temperatures as more water passes through the cool gravel, rather than being directly exposed to the sun. In the past biologists and fishery experts believed that logjams and other debris prevented fish from travelling through the stream. With this in mind, these “obstructions” were removed. As a result a vital component of salmon habitat disappeared. 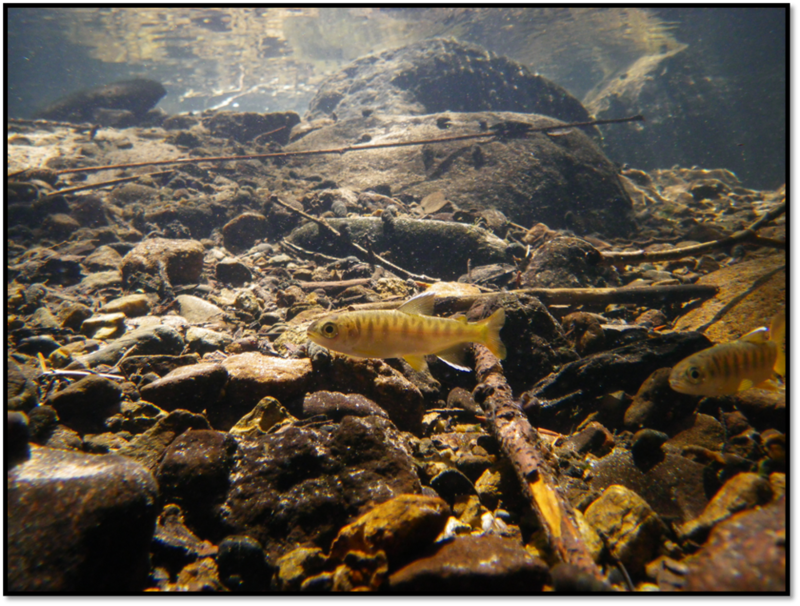 Stream flows increased, less gravel accumulated making spawning more difficult, and juvenile fish had fewer deep pools to hide in during hot summers. With research and awareness, we realize today that logjams and boulders are exactly what makes for healthy salmon habitat. Therefore, PUR works in cooperation with landowners and agencies to place logs and boulders in fish bearing streams across the watershed. Logjams are carefully designed and anchored to withstand winter flows. Excavators, yarders, and even large helicopters are used to carefully place logs, whole trees, and root wads in stream channels. Boulders can be placed in conjunction with log structures or placed individually. In larger streams where logs are difficult to anchor, boulder weirs are used. A weir is created by placing many boulders together in varying designs and clusters. Root wads are an excellent natural mechanism to build up gravel, create pools, and protect habitat for salmon. The root wads are placed in open, straight streams that are devoid of naturally fallen wood and other debris. Our biologists, engineers, and contractors have designed and built hundreds of these structures. Several logs are wedged against trees on a stream’s banks and then placed across one another into the stream channel. The result is a strong, stable, and natural appearing placement that will collect gravel, create deep pools, and improve the stream’s overall health and water quality. Boulders are placed in the channel in different shapes to promote gravel aggregation, slowing of the stream, and the creation of pools. These deep pools that are created behind the structures, benefiting fish, as well as fisherman, swimmers, and wildlife. The sediment and gravel that are gathered behind them help to create spawning habitat for various species, including salmonids and lamprey. In their 3-5 years of life, salmon make the treacherous journey to the sea and back, covering hundreds of miles. These resilient fish can jump and find their way through challenging obstacles. However, some man-made barriers prove to be impassable. Dams without fish ladders and roads that do not permit natural stream flow all block fish passage and prevent fish from reaching their natural spawning grounds higher upstream. The Umpqua Basin and Douglas County are covered in two intricate webs: streams and roads. The problem for salmon appears where these webs intersect. When a stream flows under a road it passes through a culvert, a long metal or concrete tunnel designed to allow the water to flow through without damaging the road. Driving to work each morning you likely pass over 20 or more culverts. While many do not prevent fish from heading upstream, over 800 in the Umpqua do. Three problems with older culverts affect fish passage. First, many culverts are too high for salmon to enter. Others are too narrow, resulting in such high water velocity that the salmon are overpowered. Finally, some culverts are far too steep for fish to navigate. Replace the culverts. PUR contractors safely divert the stream, remove the road surface, and replace the old culvert. There are many replacement options, depending on the area and road size. On private property, railcar bridges are often used. These bridges are modified railcars, with the wheels and axles removed and wood decking added to the top surface. Replacement culverts are commonly made from large diameter (10 feet) corrugated piping. Some have flattened bottoms with metal fins (called baffles) that collect gravel and sediment to mimic a natural stream bottom. Another style of corrugated metal culvert is cut in half down its length, creating a half arch. The arch is then set in concrete, creating a metal culvert while leaving the streambed intact. Finally, concrete culverts are also constructed, resulting in long box-like tunnels. Another barrier to fish passage is the presence of unwanted concrete dams. In the past small dams were built throughout the Umpqua Watershed for irrigation and other uses. Today, however, many landowners are working with PUR to modify or remove these impasses. For dams with existing outlets, contractors can increase the size of the outlet and install manual gates. During the winter, landowners then open the gate, allowing fish to pass upstream through the new opening. Conversely, in the summer, when water for irrigation is needed the gate can be closed. Dams lacking gates can be modified in a similar way, or removed entirely if landowners no longer need the dam for irrigation. Dams used for flood irrigation can also be removed and replaced with pump fed irrigation systems. An open creek surrounded by rolling grass hills can be attractive, but it is not the ideal picture of a healthy stream. Aquatic species require cool temperatures, cover, clean water, and insects that fall from overhead branches for food. Without native shrubs and trees, banks erode, filling water channels with sediment. Fish have difficulty finding food, stream temperatures rise, and runoff is unrestricted resulting in higher winter flows and flooding. Protecting and re- storing the area surrounding creeks and streams, known as the riparian zone, is an important component of PUR’s work. The first step in restoring a riparian zone often involves the removal of invasive species. Himalayan blackberry, for example, provides poor bank stabilization with shallower roots than native shrubs. They also hide eroding banks, out-compete native plants, and create little shade. PUR has completed many successful projects removing blackberry and other non-native plants. Crews work with hand tools or machinery is used. The excavator shown here uses a flail-type mower to easily clear large sections of bank. Once invasive plants have been removed, native shrubs and plants are added. These species have deeper root systems, which, once established, prevent erosion. They also provide better shade cover and contribute to the health of the ecosystem. Free access of livestock to rivers and streams can also significantly increase soil erosion and impact water quality.By fencing off the newly restored and sensitive riparian zone, we can maintain the health of the stream, thereby ensuring a more productive and sustainable habitat for fish and other aquatic species. Working with landowners several different types of fencing are installed, such as New Zealand electric fencing or simple three strand barbed wire. Once the riparian zone is fenced, livestock will obviously no longer have access to the water. Therefore we place permanent stock water tanks, in fields, away from the stream channel and build gravity or pump fed systems that keep the tanks full. This provides clean water for livestock; keeping the fish and landowners happy. The use of unimproved livestock crossingscan also negatively affect water quality and contribute to erosion. In this case, what is a called a hardened crossing is needed. A hardened crossing is created by fencing the riparian area and establishing only a few crossing points for livestock. These crossings are then isolated fromthe stream with cattle panels and the road and streambed are reinforced with gravel. When livestock cross the channel, banks are protected, the streambed is not disturbed, and the riparian zone is unaffected. Bridges, such as those mentioned in the fish passage section of this booklet, are also used for landowner and livestock crossings. Flood irrigation systems use open ditches to divert water to pastures. In this process large amounts of water are required, and a high percentage is lost to evaporation and ground absorption. To ensure aquatic species have as much water as possible during low summer flows PUR also works to replace flood irrigation systems with modern pump irrigation.